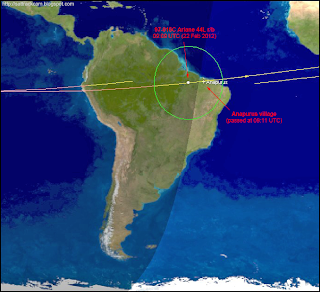 Through Carlos Bella on the satobs mailing list, news broke today that an object which almost certainly is space-debris crashed in the Brazilian village of Anapurus on February 22, 2012, near 6 am local time (9 UTC). It landed about 6 yards from a house and damaged trees upon impact. Photo's of the object can be see here.They show a spherical object that strongly resembles a spherical rocket fuel cell (tank) or a Helium pressurization tank. These are the most resistent objects among space debris and often involved in reported cases of space-debris reaching earth surface. Ted Molczan quickly noted that date, time and location correspond well to the re-entry of 1997-016C, an Ariane 44L rocket stage from the launch of two geostationary satellites, Thaicom 3 and Bsat-1A, on 17 April 1997.